I am ordering two more cow masks). The 'cow' I already have has been a big success for me - it's such a fun and practical design. As this reply box allows me to add a photo, I've attached a recent one showing my mask in use, for interest. Yes, the instrument that I'm carrying is obviously a MOOsaphone! Mask Maker Extraordinaire who helped us with the masks for our first film "Persephone". To work with Jeff Semmerling is to take a step back in time to the days when artists were not only masters of their crafts but also stewards of their art form. Jeff's work is excellently engineered, painstakingly crafted and designed with both function and comfort in mind as well as being a unique and distinctive design. We used a number of his masks for the production of our first film "Persephone" and function and comfort is of great importance to any actor who needs to wear a mask for long periods of time on set or on stage. On top of creating top quality products Jeff Semmerling infuses every mask with the history, philosophy and significance of masking as a human art-form. His masks are not mere disguises but are gateways through which we come to know our inner selves. 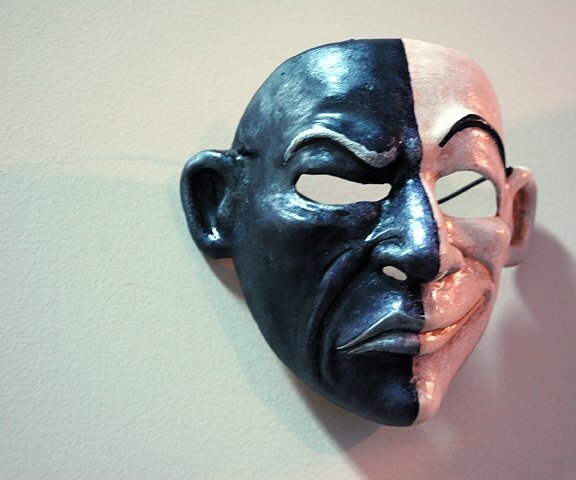 Put on a mask made by Jeff Semmerling and discover how it magically gives you a new personality. If you have never tried one on, visit him at the Art Side Out Studio & Mask Shop at the Six Corners Shopping District, 4041 N. Milwaukee Ave. Suite # 302 to experience this phenomenon firsthand. You may find the experience so compelling that you want to continue to learn about masks and mask making. Jeff offers a range of excellent classes for all levels of experience and can teach you the simplicity and the elegance of the mask-making art-form. I have two masks created by Jeff Semmerling. Both have enriched my life and brought joy to everyone who sees them! The minute you put on one of Jeff's masks, which are little masterpieces of art and artisanship, all your worldly cares fade away, because you can inhabit the character that the mask allows you to create instantly. Some would even say the mask has a "spirit" that transfers to the owner, or that it brings out in its wearer.This does not happen with all masks. Only masks made with such imagination and whimsey, coupled with such extreme attention to quality of materials and realism coupled with fancy. One beautiful leather mask I have had for 14 years. It is the centerpiece of my Mardi Gras outfit, and when I wear it I become the center of attention. 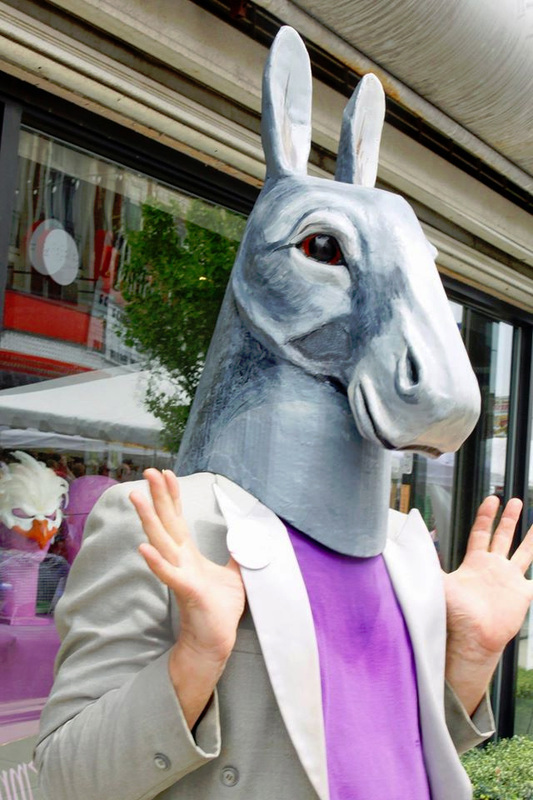 The 2nd one is a donkey mask that elicits a truly extraordinary response in me. I start braying like a donkey while talking; I can't help myself! This causes those around me to explode into paroxysms of laughter. Thus I can say that Jeff's masks have truly made me more popular and funnier, less self-conscious, and happier! These masks are by far the best masks I have ever come across. I also use them in my work with students, who lose their inhibitions and find true creativity just by losing themselves in the character the mask helps them create. Thanks, Jeff, for the fabulous contribution your care in mask making has made to easing the cares of my life. I have been wearing this mask all day on Halloween for 11 years now. Wonderful craftsmanship and I get even more startled doubletakes on the El every year. Keep up the excellent work! I just thought you might be interested that the mask you sold to me on Lundi Gras made it into the New Orleans Times-Picayune on Mardi Gras Day. I have enclosed a copy of the picture. I had a very good time wearing the leafy mask on both Lundi Gras and Mardi Gras. It evoked a lot of comments from people I passed in the crowd. I also had my picture taken with several visitors to New Orleans during the two days. It was worth the money for the fun it created. My name is Mila and I'm a 30 year old single female. I have lived in Texas for most of my life and 2 years ago was the first time I had the pleasure of experiencing the art of leather masks from the Semmerling and Schaefer ("S&S") Mask Studios (Sonja has retired). I'm a rather timid person by nature and it was amazing to me how putting on these exquisite masks can let you explore different sides of your personality. Until you've experienced it for yourself it's somewhat hard to explain, but you can be anything you want to be behind one of their masks. For example in 1996 at The Renaissance Festival ("TRF") I wore a S&S feline mask which had an extravagant boa that hangs down like a mane and I felt very exotic and got more attention than I can ever remember getting in my life. It was a very wonderful experience! It was kind of like becoming slightly feline, I was on the prowl. At my first Mardi Gras (1997) I wore a bird mask from S&S that was done in purple and blue hues. It had magnificent detail with luminous feathers coming from the top of the mask that came up like a crest. I had several people come up to me and tell me how beautiful I looked and the funny thing was that they couldn't really see what I looked like they were in actuality complimenting the workmanship of the mask. Then my girlfriend and I went to TRF (1997) and I wore a mask S&S that was made from black leather and a little devilish. She's kind of a cut-up and put on a pig mask. We had the best time! You can let loose a little and not feel so self-conscious that you may be doing something silly or embarrassing. You just put on a mask from S&S and let yourself become a little like your mask. Explore! I would suggest having more than one mask seeing as there are many different sides to most people and it's fun to discover different sides of your personality with different masks.